Object storage supplier Exablox has provided a file interface to its OneBlox object store, which is basically a Drobo-style BYOD store - Bring Your Own Disks. El Storage asked Sean Derrington, senior director of products at Exablox, some questions about the company. Some of the answers have been edited for brevity. El Storage: How did Exablox start up? Sean Derrington: Exablox was founded in late 2010 on the premise that storage was too difficult to manage and legacy solutions couldn’t support the rapid storage growth without complex administration and forklift upgrades. Having seen the problems first hand of storage limiting application growth, because it would require a forklift upgrade and the constraints and complexities of RAID, the co-founders decided to "start from scratch" and reimagine what storage should look like. Taking a cue from cloud storage providers, they believed storage should be easy to install, require very little ongoing management (as close to zero as possible), be simple to grow and have many of the enterprise features the Fortune 500 companies could afford. They wanted to bring this design goal to the mid-market where they [saw] a significant opportunity to disrupt the storage industry. El Storage: What is Exablox's funding history? Sean Derrington: Exablox was founded in 2010 by Tad Hunt, chief technology officer, Matthew Catino, VP business development, and Frank Barrus, chief architect. The company has received a total of $22.5 million in funding in two highly oversubscribed rounds: $7.5 million in Series A in 2011 and another $15 million in December of 2012. Investors include DCM, Norwest Venture Partners and U.S. Venture Partners. El Storage: What have been the main product events in Exablox' history? Sean Derrington: Exablox came out of stealth mode in April 2013 at Stephen Foskett’s Storage Field Day and introduced OneBlox and OneSystem. OneBlox employs a scale-out architecture based on our own object-based file system that presents a single global file system via SMB. Multiple OneBlox' can clustered together in a Ring and scale from a few TBs to nearly 300TBs. The OneBlox architecture enables organisations to start with exactly the needed capacity, install OneBlox in less than 5 minutes, and add additional drives or OneBlox at any time with zero configuration. With enterprise features like inline deduplication, continuous data protection, and encryption enabled by default, organisations’ information is always protected. Exablox supports a bring your own drive policy ... Customers can purchase their own drives (or through a partner) at retail pricing. They can mix and match any capacity (1, 2, 3, 4, 5, 6 TB) and type (SATA/SAS) of 3.5” drive in a single OneBlox or a Ring consisting of multiple OneBlox's. Exablox was the first vendor to support HGST’s 6TB He drive as well as Seagate’s 6TB drive. This strategy enables organisations to use the latest drive technology and take advantage of weekly price declines ... while eliminating forklift upgrades. ... [V]endors such as EMC and NetApp are just now supporting 4TB drives and charging a 10x premium relative to retail pricing. HGST 6TB drives have declined ~35 per cent since February 2014. El Storage: How does your object technology compare to that of other vendors such as Amplidata, Caringo, Cleversafe, DDN WOS, EMC Atmos, HDS and Scality? Sean Derrington: The first is the market segmentation. Exablox is solving mid-size enterprise storage problems, typically from 10s of TBs to hundreds of TBs. Many of the vendors above are focused on the largest organisations that have PB size storage problems. They are focused on the top 10 per cent or companies – Exablox is focused on the other 90 per cent. Click the pic to play the Vimeo vid. ... In addition to selling to organisations, we’re also focused on the managed service provider market. With our incremental pay-as-you-grow pricing model—simply continue to scale-out, cloud-based, multi-tenant management, and enterprise features, service providers can deliver storage and data protection offerings without having to over invest in the storage capital. ... [R]emote replication can be set up in four steps and three minutes. This, combined with OneSystem, gives organisations and service providers proactive and global visibility into their storage. El Storage: How does Exablox's filer access compare to other vendors' filer access? Sean Derrington: Most object storage vendors require Restful or custom APIs to access the storage. OneBlox makes available the most ubiquitous access method—SMB. This approach eliminates any custom application development. El Storage: What is Exablox's channel to market? Sean Derrington: Exablox is committed to a 100 per cent channel strategy. For the first time, the channel will now be able to deliver an affordable, on-premises, scale-out storage solution with leading-edge enterprise features including inline deduplication, continuous data protection, encryption, and zero-configuration storage expansion. ... We have been building a channel strategy enabling the channel to easily solve customers’ storage challenges by having a simplified initial sale (there are only 3 SKUs), healthy margins, and a recurring revenue stream after the initial sale. 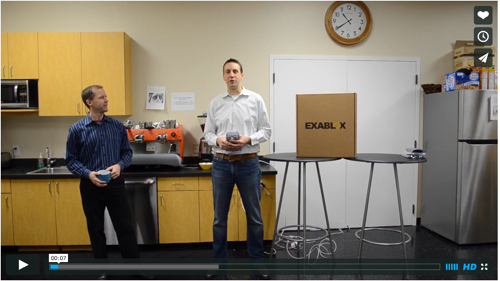 El Storage: What is Exablox' view of the object storage market and its role within it? Cloud storage providers like Facebook, Amazon, etc. realise the ... benefits of object-based storage. Exablox is bringing these benefits to organisations of all sizes and for use with ‘traditional’ applications. El Storage; What is Exablox' strategy for product and technology development? Sean Derrington: Exablox has spent the past three years developing OneBlox and OneSystem. With more than 15 patents (some awarded, some pending) the intellectual property of Exablox is in our software. While the solution is delivered to customers in an appliance form factor, the value is in the OneBlox software and OneSystem cloud-based management. We custom designed our appliance hardware with industry standard components (it’s not just a Supermicro chassis) to include an LCD on the front panel and tool-less drive bays—all aimed at simplifying the storage experience for customers. Exablox's channel strategy looks good and the BYOD approach to populating its appliances with drives looks to deliver cost advantages with the inconvenience of having to buy and insert the drives. But if the 10x price differential is real then this could be a compelling feature, avoiding the mainstream supplier's disk drive "tax".